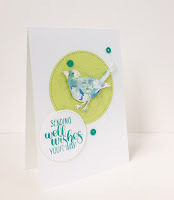 We were smitten with Ingen's little splattered bird and her clean and crisp-looking design! All the colours of the challenge were used in such a natural, organic way! It just goes to show you how a little splash of colour can make a big impact! Gail gets an A for creativity! There are so many elements to mention! 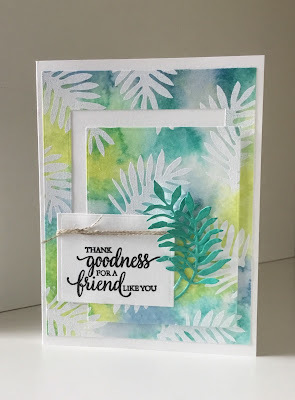 The gorgeous misted background, the lifted and offset frame center, the leaf fronds echoing the background design and the layered look on the sentiment! The Design Team just loved the beautiful way Gail displayed our Colour Challenge! Thx so much ladies... I’m really enjoying the challenges!